We are asking local residents to report sightings of mountain goats travelling from one mountain to another. The survey area is bounded by the Bait Range and Babine Lake to the east, the Howson Range and Telkwa Pass to the west, Hazelton to the north and Houston to the south. 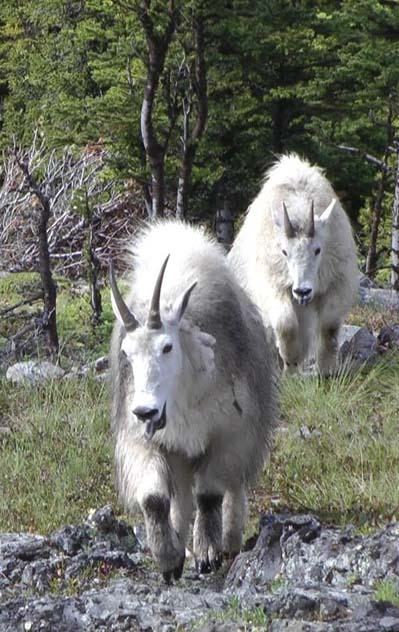 Residents can email mtgoats@bcnorth.ca or phone 250-847-4802 to report any sightings within the last ten years. We have designed an interactive web page to calculate the relative difficulty of a mountain goat dispersal path from one specified mountain to another mountain. For more information, visit our Dispersal Calculator page. To date there has been a lack of DNA analysis of tissue from mountain goats in British Columbia to determine how genetically isolated the various goat herds are from one another. This research can tell us if inbreeding and lack of genetic diversity threatens our mountain goats. At the same time, every mountain goat that is harvested by resident or non-resident hunters in British Columbia must be inspected. The inspectors can easily clip a small piece of hide at each inspection. All the tissue samples together will serve as a province-wide DNA bank. Since 2016 we have supplied 950 tissue sample kits to the province of British Columbia for distribution to the mountain goat inspectors. The tissue samples are packed in salt, tagged and stored for later analysis. This DNA bank will be invaluable in the future to compare genetic diversity and to track the health of mountain goats in BC. Our society directors have monitored many of mountain goat herds in our region for decades. We have documented population numbers and incidence of disease or injury. We also note winter snow conditions on local mountains. Some winters with deep or hard-crust snow are very challenging for mountain goats, especially for young kids and yearlings that have difficulty pawing for browse. We also photograph the local herds as an historical record of herd numbers and even individual goats. Mountain goats are some of the least studied large ungulates in North America. To remedy the lack of information about goats, we have extensive video and still photos that we turn into video clips that explain the behaviour and lifestyle of mountain goats. The clips are posted to YouTube and listed on our Mountain Goat web site at www.mtgoats.ca/gallery.asp.